We decided to spend the day at the Cleveland Zoo. We had so much fun there. That zoo is just wonderful. There is just so much to see. I really enjoyed the elephant exhibit they have there. It is so large and spaced out so that the elephants have a lot of room to roam around. While we spent the day at the zoo, Liam got to spend the day at Petsmart’s Doggy Day Camp. 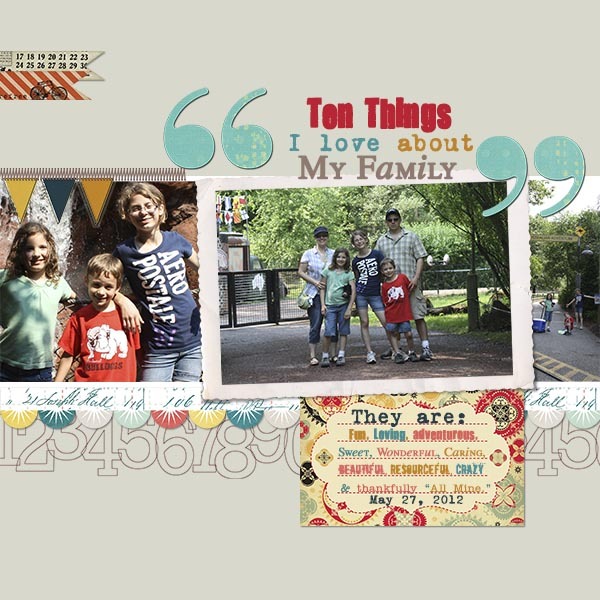 The layout above shows my family in a few of our favorite spots at the zoo. Well, spots where I could set my camera on something and run back to my family quick enough before the timer went off. In the 1st photo, the kids are under a waterfall under the Playground Tree they have. The kids got to run on all these bridges and then end up inside the middle of a big tree. Inside the tree was a great, big slide for them to go down. Needless to say, they spend quite a while there. In the 2nd photo we are in the middle of the Australian Adventure Exhibit. You get to walk through this path with the kangaroos all around you. It’s wonderful to see them laying back enjoying themselves. I wish our zoo back home had a kangaroo or two. In the 3rd photo you can see the kids just entering the Australian Adventure Exhibit. I hope the kids remember all these fun adventures we went on as they get older. Ten Things just doesn’t even begin to cover what I feel for my family. I have to say, that I am one lucky girl. Previous Post Happy 11th Birthday Emerson!